Montreal, February 8, 2017 — This morning, the City of Montreal Executive Committee is expected to take the first steps to declare Montreal a “Sanctuary City”, similar to the hundreds of Sanctuary Cities that already exist in the United States, and more recently in Toronto, Hamilton and Vancouver. Declaring Montreal a “Sanctuary City” is not sufficient on its own. “The City of Montreal needs to get beyond easy symbolism, and undertake tangible measures to ensure non-cooperation with the Canada Border Services Agency (CBSA) to end deportations and ensure access without fear by undocumented migrants to all essential services, including health care, education, and housing,” says Stacey Gomez, a community organizer with Solidarity Across Borders, a migrant justice organization in Montreal active since 2004. Inspired in part by Sanctuary Cities in the USA, but crucially motivated by the autonomous organizing of undocumented migrants who resist deportations and detentions and create and sustain networks of mutual aid and support, Solidarity Across Borders has actively campaigned since 2009 to make Montreal a “Solidarity City”. – work to make sure that labour and other human rights standards are applied equally to all, regardless of immigration status, in our organizations, workplaces, and communities. For Solidarity Across Borders, the Solidarity City Declaration is the basic template for the City of Montreal’s own possible Sanctuary City. This includes non-collaboration by the Montreal police (SPVM) with the CBSA. The City of Montreal has direct authority over the SPVM, who every day arrest and hand over undocumented migrants over to the CBSA, in flagrant violation of what minimally a Sanctuary City is supposed to be. “If more than sixty Montreal community organizations have already agreed to not cooperate with the CBSA, then a genuine Sanctuary or Solidarity City in Montreal must do the same, including barring border agents from all City premises,” says Jaggi Singh, also a community organizer with Solidarity Across Borders. 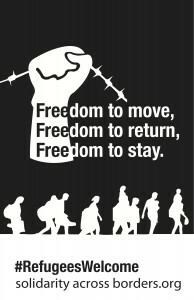 As part of its Solidarity City campaign, Solidarity Across Borders has demanded free access to primary and secondary schools, as well as hospitals, clinics, and other services for undocumented migrants. By way of example, undocumented kids are still unable to access free primary and secondary education, while undocumented migrants are fearful to access health services, or cannot afford to pay. There are at least 50,000 undocumented migrants in Montreal, if not many more. Beyond ensuring total and complete non-cooperation with the CBSA, Solidarity Across Borders highlights that undocumented migrants are created by exploitive and unjust economic and social policies. In particular, they re-iterate their main demands for an end to deportations, detentions and double punishment, and the implementation of an inclusive, comprehensive and ongoing regularization program for the more than 500,000 undocumented migrants living in Canada. “Ultimately, we need to draw on the tradition of struggle and resistance from diverse working class, immigrant, and oppressed communities in Montreal and become a Rebel City that demands open borders and status for all,” says Singh. “Without grassroots pressure, opportunistic politicians will be content with empty symbols, gestures and photo-ops,” adds Gomez.